Smartboard, also known as interactive board, is being used in institutions. Interactive board allows a teacher to use hands for interaction (click, scroll, zoom, etc.) which remove the dependency on input tools like a mouse or digital pen tablet. This feature of smart board allows a teacher to use an interactive board as a traditional board but with the smart features. Smartboard uses touch detection for user input that means a teacher can click on a button with the help of finger. So we can say that software limits the capability of a smart board. If a software doesnot has a feature to drag objects than you can’t do that on a smart board. It also means that a software can increase the capabilities of a smart board. All we need is a software that provides a pen to write on smart board with the finger, highlighter to highlight a portion of smart board, a ruler that can be used freely, Google maps to teach geography, animation to make learning enjoyable. In this article, I will introduce a free software for interactive board specially designed for teachers. Hope you will find this article useful. Open-sankore is a free and open-source software designed for teachers to use with interactive board. It has almost everything required to teach in a classroom. It runs in a full screen mode and hides everything on your computer screen this allows you to use more area for teaching. Below is the screenshot of open-sankore running on Windows operating system. You can see that it does not have a title bar and also hides the task bar of operating system. I am listing most of the features of open-sankore so that you can decide whether it is suitable for you or not. There are software, designed specially for smart board but this one is special because it is designed with the help of teachers for teachers. It do not only allow to write, draw and delete from smart board but it also gives you traditional teaching tools and ICT tools like Google maps that can be used in a classroom. Designed for the efficiency. It has a lot of tools with many options, but you will not find it difficult to find a tool or reach to a tool. It makes it number one choice for teachers as you don’t want to spend all your time in searching tools or struggling with how to use a tool. Instead, you will spend your time only in teaching and make study interesting for students. The tools, provided in open-sankore, can be divided into two sets traditional tools and ICT tools. Let’s have a look at them. 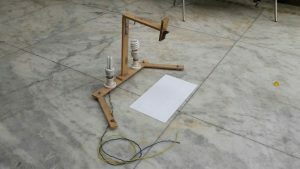 Traditional teaching tools are the tools that you use in a classroom without a computer. For example, pen, pencil, rubber, ruler, compass, calculator and many others. Some of these traditional tools are shown in the image given below. You are aware of the fact that teaching is not only provided by these traditional tools, but we also use information and communications technology (ICT) tools in teaching. A geography teacher might use Google maps, a math teacher can use mathematical function drawing program. Almost all teachers use internet, audios, videos, images and animations. These all tools are integrated into open-sankore. If you want to visit a website you can use integrated web browser; similarly, you can embed YouTube and Vimeo videos in open-sankore. You can upload your audios, videos, images and flash animation files in open-sankore. below is the snapshot of Wikipedia used inside open-sankore. If you create educational videos or want to record everything you teach in class. You do not need to use another application to record screen. Open-Sankore has an inbuilt podcast recording feature. With this option, you can record all your activities on open-sankore with audio and save it as a video on computer or publish it directly on YouTube. Open-sankore also allows you to use all its tools on the desktop. This feature is useful if you want to draw on desktop or any other application on your computer. I used it to annotate code::blocks compiler while teaching programming in a workshop. Sometimes you create learning material in PowerPoint slides or pdf. You can import these files in open-sankore and use all features of open-sankore on these files to teach effectively. Each page of ppt or pdf loads in a separate page of the open-sankore document. You can also import images, iweb files, folder of images in open-sankore. Once you finish teaching, you can share the open-sankore file in shareable formats. Open-sankore allows you to export the document in pdf format. You can also share open-sankore files directly to sankore web. The podcast saves as shareable video format which can be uploaded to various video sharing sites or your server. When you start working on open-sankore software, it automatically saves your document with DD-MM-YYYY HH:MM:SS name. Your document remains available on open-sankore even if you do not save it. All documents, you worked on, can be found under Documents menu, available at the top-right corner of the software. Open-sankore team integrated everything in one software. Web, audio, video, animation and teaching tools all are available in one software. It means you do not need to switch to another application while teaching with open-sankore. If you have ppt or pdf you can import it in open-sankore and if you want all sets of features to remain available in desktop then you can switch to desktop mode. You can also record ScreenCasts from open-sankore. It automatically saves all your documents. Open sankore is available in multiple languages for Linux, MAC, and Windows. The latest version as on 30 March 2017 is 2.5.1 which can be downloaded from here. Download and install it on your machine and let me know how do you find it. Important note: Although Open-Sankore is for interactive board but you can use it with touch screen laptops or digital pen tablets as well. I hope this article will be helpful to you. Let me know about your views in comments. The link provided for downloading Open Sankore does not seem to work. Can you please provide the correct link? also updated the link on article. I have also updated the link in the article. 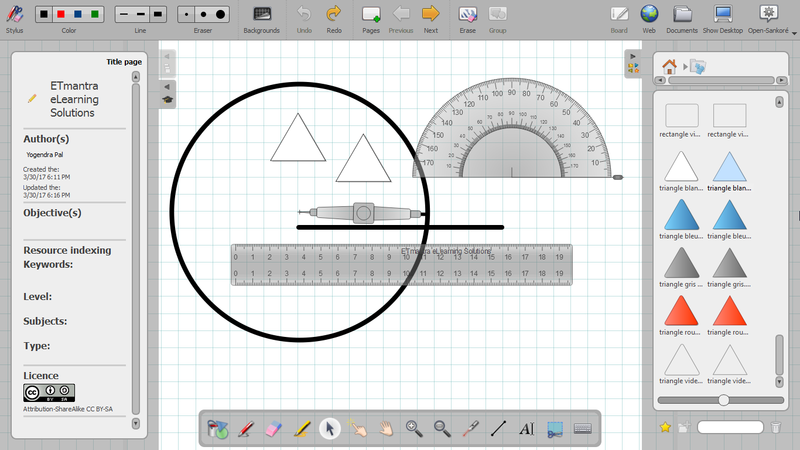 Great software but is there going to be the option for lined ‘paper’ as well as the squared?